Kleefeld on Comics: On Strips: Kenosha! This weekend in Kenosha, WI is the Kenosha Festival of Cartooning, a festival dedicated to comic strips. Their short description of it reads: "Cartoonists and comic strips arrive in Kenosha, WI for a 3-day festival, including a massive exhibit of comic strip art, lectures, presentations, Q&A and meet-and greets with the artists, and more!" It's only a few years old, but they've been drawing in some great talent from the outset. This year, the guest list includes: Mark Tatulli, Bill Morrison, Darrin Bell, Mark Anderson, Jan Eliot, and Ed Steckley. Sadly, due some other commitments, I won't be able to attend like I was hoping. But I want to throw some attention on the show for a couple reasons. First, it's free for everyone. No cover price, so your cash outlay for enjoying everything at the festival boils down to how much it costs you to get there. It's about an hour drive from Chicago's northern suburbs, and it could easily be a series of day trips for anyone in that area. (I visited Kenosha back in May to run the Wisconsin Marathon, and I was really surprised how quick and easy it was to get up there!) Milwaukee is even closer! I have seen how hungry the public is to meet these artists and see how they create their art and hear why they decided to become cartoonists and how they achieved their dreams... 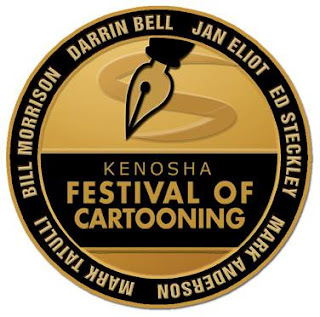 I have had such a terrific experience at the festivals I've attended that, in 2011, I jumped in with both feet and created the Kenosha Festival of Cartooning. If you're able to attend, I strongly recommend going. I can't say that I've had first-hand experience to vouch for everything personally, but it sounds like a wonderful festival and I'm sorely disappointed I've never been able to fit it in my schedule. Everything I've heard about it so far has been extremely positive, both from professionals as well as attendees. So head over to Kenosha, take lots of pictures, and see how jealous you can make me!